Adding "one more" and taking away one to get "one less" are skills which can be learned at this stage - and which createe a base for learning simple addition and subtraction soon after. One more and one less are easy concepts for your child to visualise, especially if you use simple aids and use language carefully to help prepare them for the "sums" that follow. You are aiming for your child to understand that they simply "count on" or "count back" to get the answer. Introduce the vocabulary: one more, one less, add one, plus one, less one, one fewer, take away one, subtract one. Use real objects or manipulatives. Small toys or snap cubes (Duplo or Lego) work well. Give your child 3 objects and ask them to count. What happens if I give you one more? Do you need to count them all again? Can you just count on one? Number lines help children to visualise. 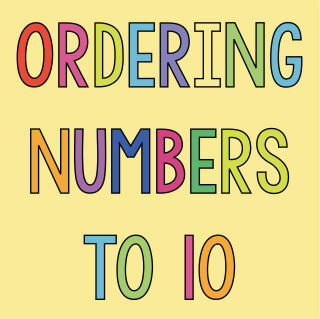 Print out one of our number lines from 0 to 10 - choosing from the many Number Lines available here. Grab a group of kids! Put 2 or 3 children in a group and "add one more". How many now? Add one more? How many now? Keep going until you reach 10 - and then start "taking one away". Play hopscotch. Draw a number line on the ground with chalk and ask children to stand on a number, then "hop on one" or "hop back one" and call out the number they land on. Can the kids fill in the blanks in this table, by writing one less and one more than the numbers in the middle? Make maths fun with this adorable monster worksheet which helps children to practice "one more" and "one less". Introduce the most simple of subtraction by taking one away from numbers 1 to 10. This set of 3 worksheets works through some word problems and then introduces a few "sums" for the children to try, all with the help of a number line if necessary. Adding "one more" to a number is the first step in teaching children about addition, and it is easy with the help of a number line. These 3 worksheets take the kids through the process with words and then with the simplest of "sums".